Over the decades, I have enjoyed watching the ups and downs of clematis cultivars on the international best-seller list and, on a more modest scale, at our nursery, Joy Creek Nursery. With so many new cultivars being released annually to distract the public, I am always amazed that the tried and true names like ‘Nelly Moser’, ‘Henryi’ and ‘Jackmanii’ continue to hold a fair share of the market even though in human years they are well past retirement. It was with great surprise last year that a plant that had been on the market for at least 20 years in the United States suddenly became a nursery best-seller. Out of the blue, one day, we began to receive orders from customers who had read an article in Garden Gate magazine about Clematis PINK CHAMPAGNE, originally named ‘Kakio’. The orders came in briskly and surpassed the orders of all other clematis in our catalogue last spring. What was most surprising was that Clematis ‘Asao’, the sister of PINK CHAMPAGNE and usually a better seller, did not sell well at all. Both plants are the results of a cross done by the Japanese hybridizer Kazushige Ozawa between (what we think was) Clematis ‘Ernest Markham’ and Clematis ‘Crimson King’. There were three seedlings that were released from this cross but only the two sisters remain. ‘Asao’ and ‘Kakio’ are very similar in appearance with bright rose red flowers in April. As the flowers of both cultivars age, they become lighter at the bases and centers of their sepals. ‘Asao’ is usually the first of all our large-flowered clematis to bloom at the nursery in the spring followed soon after by ‘Kakio’. (By the way, the names refer to actual small towns in Kawasaki near the hybridizer’s home. Raymond Evison, the well-known English hybridizer and nurseryman, visited Japan in 1984 and received ‘Kakio’ from Mr. Ozawa. He renamed it PINK CHAMPAGNE for marketing purposes.) It is interesting that even though the two plants are close in appearance, Mr. Ozawa chose to release both instead of choosing one over the other. Why is that? I think it is because he had come to love both of them and thought they were different enough in character to warrant release. ‘Asao’ is the more star-shaped of the two. She is also the flashiest in appearance with flowers that show extra sepals. Sometimes this results in flowers that are semi-double or even completely double. ‘Kakio’ has what appears to me to be an underlayment of lavender on its more rounded sepals. This underlayment gives the flowers a smoky appearance. 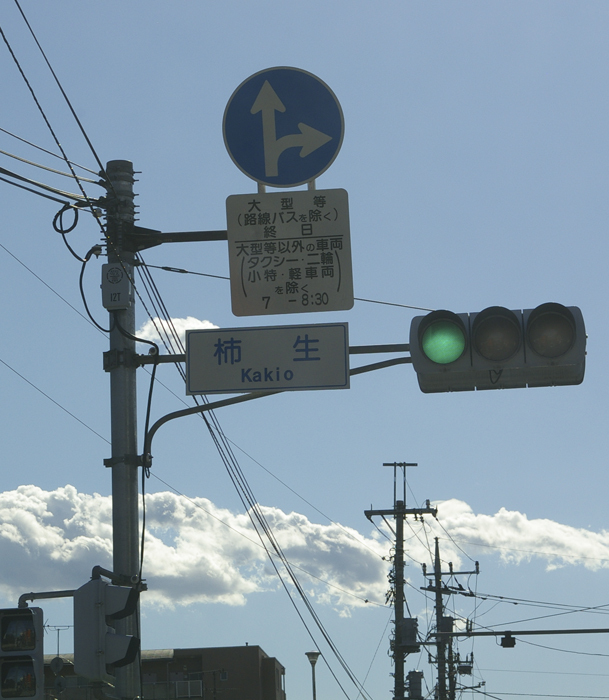 I have never seen ‘Kakio’ double. Neither sister produces much fall bloom although they sometimes manage a lovely stray flower or two. It is the stunning spring bloom that is so memorable. It is long and unforgettable enough to make a gardener anxious for spring to see the familiar flowers again. Over the years Mr. Ozawa gave up growing and selling both plants. He said that the temperature index in the Tokyo area had gone up so much since the plants were released that they no longer retained their crisp colors when they bloomed. He told me that both were more suited to areas with cooler spring temperatures. I remember a visit he made to our nursery when ‘Asao’ was in bloom. He was delighted to see the flowers looking the way he remembered. I have no idea what clematis will become the most sought after this coming year. But if you want one or two reliable and remarkably beautiful spring flowering clematis, either or both of these “new” classics will do. Clematis ‘Dark Dancer’ has had a long history. We discovered it sixteen years ago as a seedling in our stock fields. The four tapered sepals of its rich violet flowers were darker than we had ever seen on an alpina-type Clematis. They nodded at the ends of amazing purple black stems. This was a special plant, we felt, but we wanted assurance that it was unique enough to release. We propagated it, protected it and kept it alive in various sizes of pots for more than a decade while we evaluated it. Finally, as part of the celebration of our 20th Anniversary, we decided to make it available to home gardeners. ‘Dark Dancer’ is an April bloomer, often flowering during our rainiest days in the Portland area. The long sepals can measure up to 2 ½ inches long. A sparse interior skirt of “staminodes” is white and blends with the white filaments and pale yellow anther connectives. The burgundy buds are narrow and tapering. In the Pacific Northwest, good morning light with relief from the afternoon sun in summer ensures a healthy plant. Prune lightly after the spring bloom if you want to promote a second, more modest flush of bloom. Otherwise, sit back and enjoy the attractive silvery seed heads. Because it blooms on wood produced during the previous year, do not prune it in the spring. This is a deciduous plant. 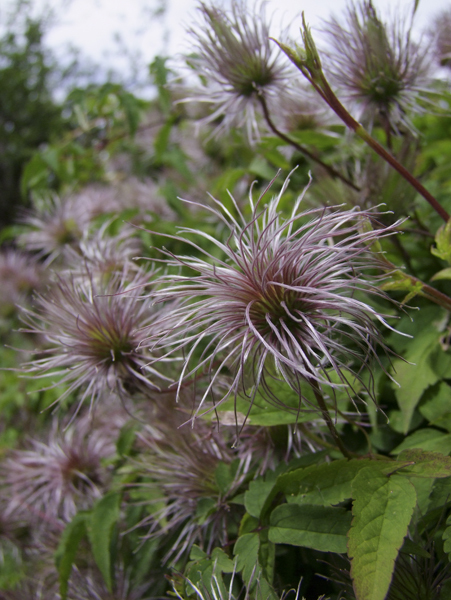 Clematis ‘Pink Pinwheel’ derives from a different species of clematis – Clematis integrifolia. This is an herbaceous species that does not climb but generally reaches 2 to 3 feet in height and flowers sequentially down its stems. Early in our history, we were inspired by the work of the Japanese clematis hybridizer Kazushige Ozawa who selected such plants as Clematis ‘Andante’ and Clematis ‘Hanajima’. We were fortunate to receive many unnamed seedlings from him. One of them has huge leaves and flowers and is double the height and size we usually associate with this species. We have used it as a seed source and raised countless seedlings from it. This is the first of eight that we ultimately planted out in our test garden. The blooms of ‘Pink Pinwheel’ have four tapered sepals that recurve and twist giving the flowers a real pinwheel appearance. The flowers face slightly outward away from the plant. There is light bronzing in the young leaves. 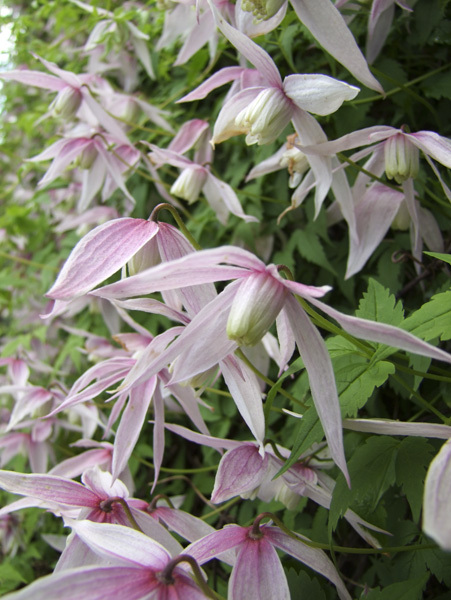 Its sister Clematis ‘Pagoda Pink’ is very different in appearance. Where the flowers of ‘Pink Pinwheel’ have a windswept look, those of ‘Pagoda Pink’ are contemplative, hanging downward. Its sepals recurve upward mimicking the roofline of a pagoda. Their rosy pink coloration is complimented by bronze young foliage which is present throughout the growing season. We cut this back by half after the first round of bloom and had a wonderful late bloom with lots of eye-catching bronze foliage. Ultimately, both these plants reach about 2 ½ feet in height in our garden. We keep them upright by tying them loosely with garden twine to a sturdy stake apiece. If you do so, the plants will be a little more than a foot wide. If you let them sprawl, they will be much wider. Because they are herbaceous, cut them back to a few inches from the ground during the winter any time after a hard freeze. These are the first of many new clematis that we hope to share with you. After a long winter of cold and rain, I look forward to bright colors in the garden. By April, I am overly familiar with the cream colored flowers of Clematis cirrhosa and its many cultivars that have bloomed all winter. Although I love the fragrance of the white flowers of Clematis armandii ‘Snow Drift’, their show is not long. It is at this transition period that many clematis in Section Atragene (which include the many selections of Clematis alpina and macropetala) come to prominence. In our garden at Joy Creek Nursery, Clematis ‘Willy’ and ‘Constance’ leaf out quickly, completely filling in their wire frame supports with a dense cover of apple-green leaves in April. Their downward facing flowers show off the rich color of the reverse sides of their tepals – ‘Willy’ revealing rosy pink tepals outlined in white and ‘Constance’ matte rose-colored tepals. They are a sight for eyes that are starved for color. 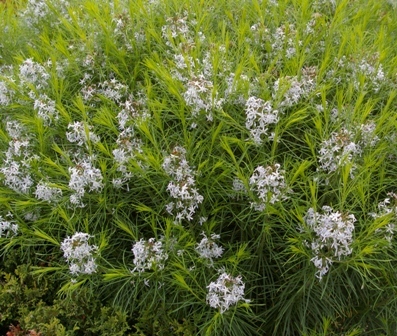 Because ‘Willy’ and ‘Constance’ are in seedhead by June, many customers assume that they do not repeat bloom. We have experimented with these clematis and what we found is that if we dead-head the vines after they have finished blooming (cutting out about the upper fourth of their growth), they will send out new leaves and buds. These buds will open in June and July. The summer show is not as plentiful as that in the spring but it is still worth the effort. Sometimes we find the stems of these plants become very woody and unmanageable with age. Last year in early June, we cut both ‘Willy’ and ‘Constance’ back to the lowest growth point on the stems (about 10 inches from the ground) in an attempt to clean up the older growth. Visitors to the nursery worried that we had killed the plants. There was no need for alarm. They grew back quickly. This year they are as bountiful as ever. This is the second time we have done this maintenance on our 17 year old plants.